Here’s how to plant tomatoes for the sturdiest plants, bar none. Give this method a try in your veggie garden this year, and you’ll have strong, abundant tomato plants. Tomatoes are a staple for most gardeners and for the most part, they’re pretty easy to grow. They just don’t take a lot of extra work in most regions of the United States. 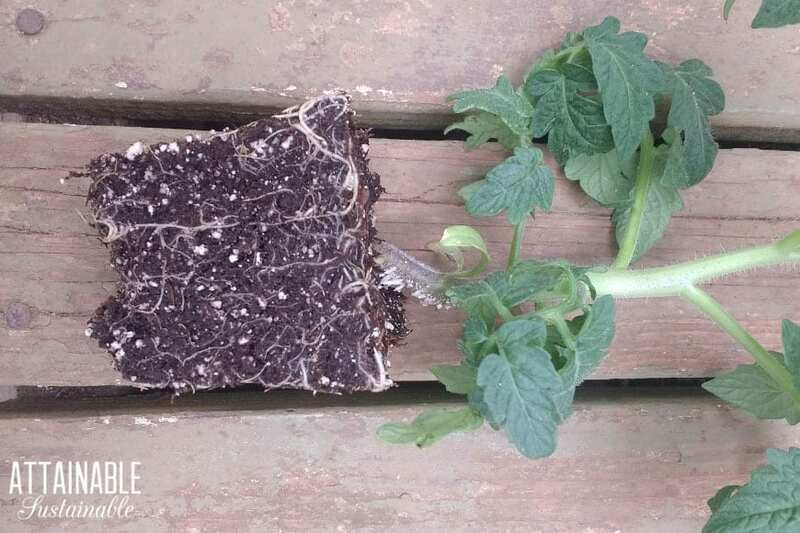 But you can really boost the sturdiness and root system of your tomato plants with this trick. 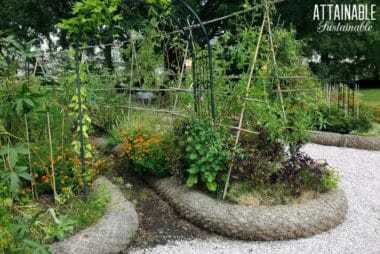 This method of planting tomatoes gives them a solid start, making for a sturdier and stronger plant. 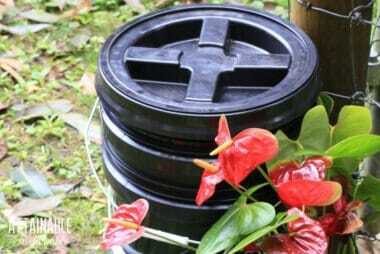 With most other plants, you want to set the plant in the earth so that the soil level of the potted plant is at the same level as your garden soil. Tomato plants, however, like to be planted deeper than that. If you’ve ever grown tomatoes, you know that their stems are very fleshy. Those stems will send out roots if they touch moist soil. Well guess what? If you were to bury those stems, the plant would send roots down into the soil. You can see it happening on the seedling below. 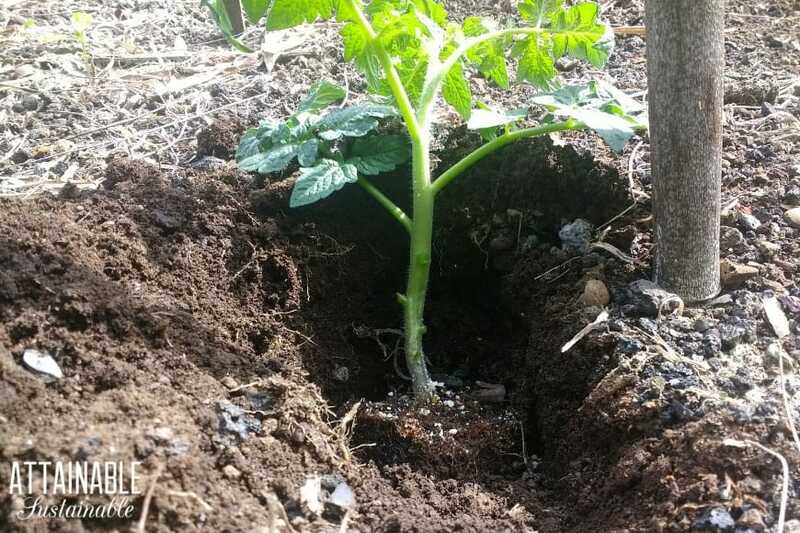 But even if there are no root buds visible, the tomato plant will send out little roots from that buried stem. This makes the plant much more stable in the ground and gives it more opportunities to pull up nutrients. Another benefit to planting tomatoes in this manner? That could mean a deep hole. Or it could mean letting the tomato lay on its side in the hole. 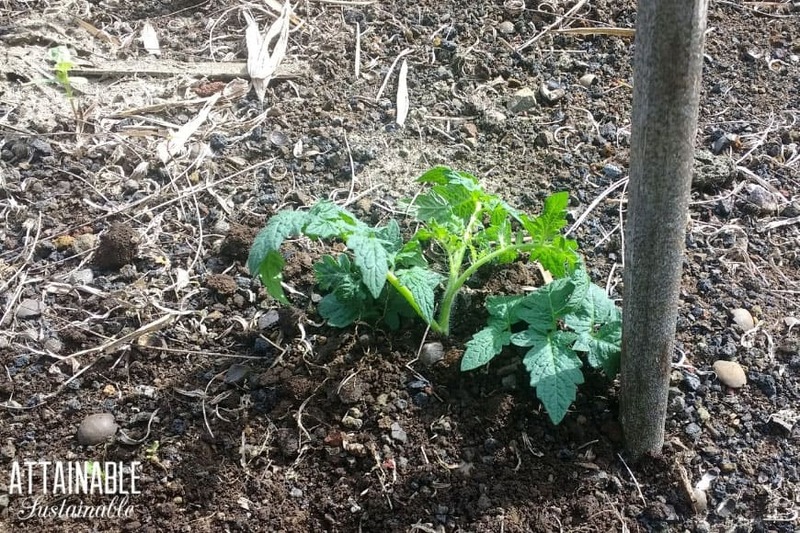 If you opt for laying it sideways, the top of the tomato plant that is above ground will start growing straight up in just a few days’ time. Related: Upside-Down Tomatoes — Grow Vertically to Save Space! A plant with a strong root system is much more able to withstand dry periods and prolonged drought. 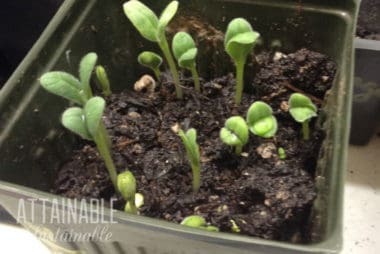 This deep planting method is a great way to salvage tall, gangly seedlings. Simply trim off some of the lower leaves, and plant the tomato seedling in the ground all the way up to the lowest set of leaves. Tomatoes do well with a good deep watering followed by days of no water at all. This encourages the roots to work even more deeply into the soil, seeking out moisture. You can implement a deep watering technique like a traditional olla or a more modern copycat with a drainage pipe or even a nursery pot buried upright next to plants. Instead of watering at the surface, water into the pipe or pot so the water goes straight to the roots of the tomato plant. Do you need to prune tomatoes? Less foliage makes it easier to spot insect invaders. In particular, I battle tree leafhoppers. If I can see them, I can remove them by hand. 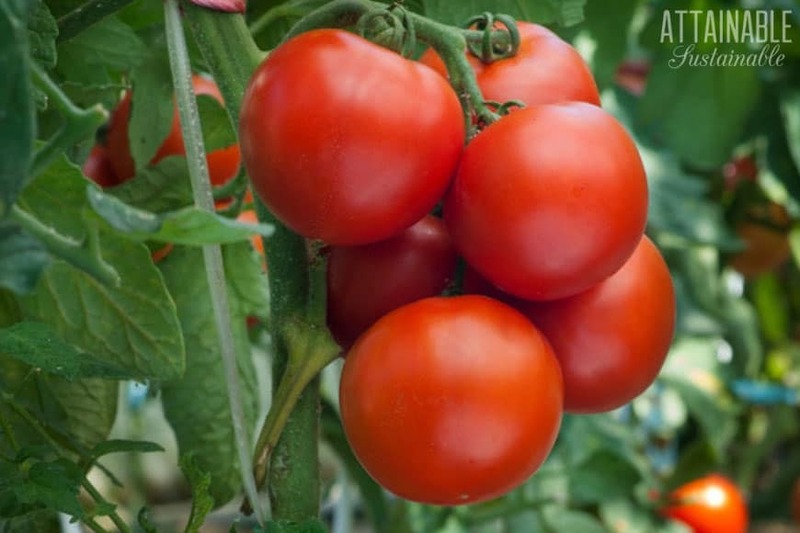 Spotting ripe tomatoes is easier when the plants are opened up by pruning. Now, am I going to tell you how to prune tomatoes? No I am not. Because it turns out, I’ve been doing it wrong all these years. I’ve always pruned out some of those big, floppy leaves that don’t make fruit but pack the tomato cage with lots of greenery. Turns out, folks in the know say I should be pruning off the suckers instead. Doing this, they say, makes for an earlier crop of larger and healthier tomatoes. I’ve been pruning my tomatoes incorrectly for roughly twenty years. My overflowing abundance of tomatoes during my California years (shown above) makes me think my pruning method hasn’t impacted production. 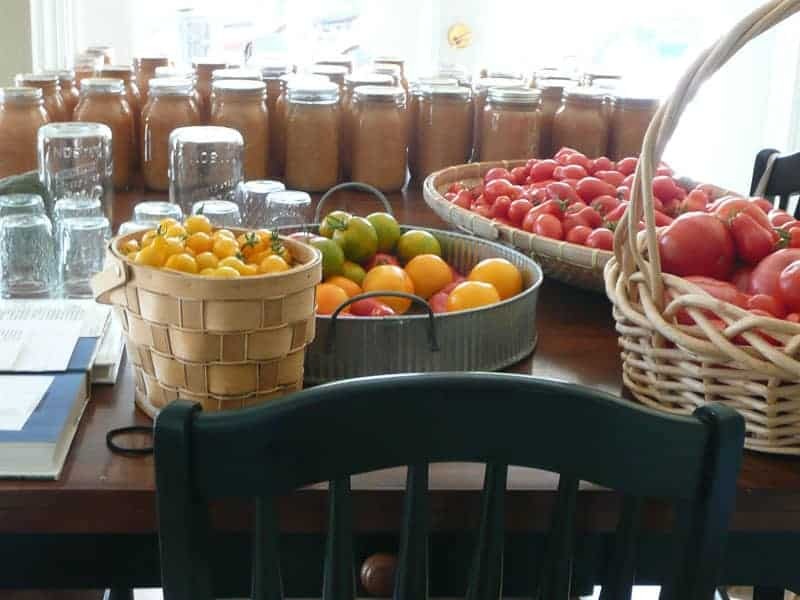 Do you grow tomatoes and have an abundant harvest? You’ll want to these fried green tomatoes or give canning tomatoes a try! 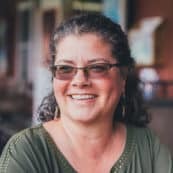 I recommend this salsa recipe. Watch it there Dolby, you are blinding me with science! Good to know, might explain why my starts this year, well, stopped. Will try again. I have heard it is good to put a tablespoon of epsoms salt in the hole before putting in the plant. Is this correct? What does it do for the plant? It adds magnesium to the soil. My tomato saplings are decaying from the root and it will die within two or three days,what’s the reason for this. Thank you for your info. I did not plant the tomatoes the way you do, but I will do it next year. There are so many suggestions on “how to” for tomatoes, I picked out the suckers, I have green tomatoes, getting ready to turn red. Question: I found 2 “tomatoe worms” one day, 2 more next, I picked them up and killed them, they did the job on 3 plants! We live in Ohio, what do you recommend? All I’ve ever done is handpick. They usually appear about midsummer, so I keep my eyes open for their droppings and find them before they do too much damage. Yes, you need to prune tomatoes, but only indeterminate types. Regarding determinate tomatoes, you should avoid pruning, with the exception of those 1-2 leaves that reach the ground.